There is something quintessentially English about the notion of progressive folk music, and Oceanfield, a three-piece band from the Lake District, certainly make no secret of their Fairport/Steeleye/Renascence influences. Indeed, percussionist Steve Harley has played with Fairport Convention in the past, and also lent his rhythmic skills to Marie Brennan (Clannad). 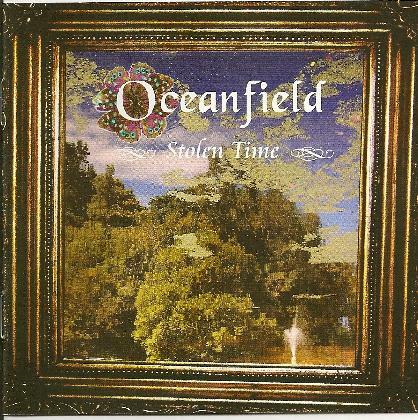 In January 2008, Oceanfield released their debut album “Stolen Time”, bringing a distinctly harder edge to the folk-influenced sounds. The vocals of Jane Barrett have a decidedly dark tinge to them, maybe even a touch of Souxie Sioux (a la “Spellbound”) in amongst the Sandy Denny, although “Stolen Time” is nobody’s post-punk album. Chief musician in the band is Chris Holmes, contributing bass, keys and mandolin, as well as volume-cranked guitar on tracks like opener “Isabella” and “Live And Learn”, which might even have been single material in an alternate universe not dominated by noisy teen angst and Xerox-copied R&B drivel. “Ghosts In Time” is a medieval folky number, with acoustic guitars, mandolin, Bodrhan, and Barrett’s multi-tracked harmonies sounding very “pure”. Then it’s back to loud guitar-based progressive rock territory for “Dancing In Bedlam”. The 13 minute grand finale of “Speaking Angels” works across the band’s full range of styles, starting with acoustics, before moving into almost power ballad territory (but in a good way! ), and ending with a soaring electric guitar solo. Progressive rock isn’t a style of music set to take the 21st century world by storm, but die-hard prog fans, and perhaps even not-too-purest folkies, will certainly enjoy “Stolen Time”. For more information you can visit the Oceanfield web site at: http://www.oceanfieldmusic.com.